I used to watch a lot of Stargate: SG1 (I liked it quite a bit better than the film) and so this is the kind of Just Cause 3 Easter Egg that's right up my alley: A "Stargate Teleporter" discovered by Redditor OniZombies that, a few little details notwithstanding, fits the bill quite nicely. The teleporter itself is easy to find, as it's located in a very visible missile silo on the western part of the map, near Porto Darsena. The trick is activating the thing, which is done by pressing the four buttons near the silo entrance in the following order: 143421. 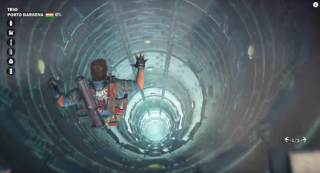 OniZombies didn't reveal how he came up with that combination, but entering will open the silo doors to a teleportation tunnel—a wormhole, you might say—that will drop you off on the other side of the map. It's unfortunate that the teleporter doesn't lock chevrons or spin up when it's live, as real Stargates do, but the wormhole effect is certainly on the money. True Stargate nerds will note that the code to activate the teleporter only has six digits, while proper Stargate addresses have a minimum of seven chevrons for intragalactic travel; however, because the planetary origin and destination are the same, it's arguable that a six-digit address is sufficient. (Say it with me: nerrrrrrrd.) In any event, the bottom line is that it works: It's a fun little tribute, and a super-convenient way to get from one side of Medici to the other. Haven't read our Just Cause 3 review yet? Do it here.